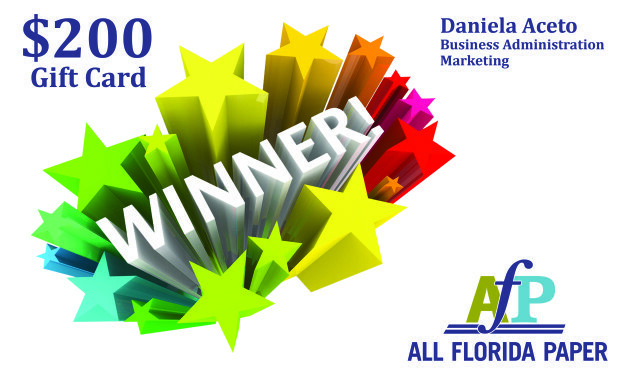 All Florida Paper is happy to announce the winner of our career fair raffle. Students and alumni at the FIU Business Career Expo held at the FIU main campus in Miami who visited our company booth, and provided their resumes to us, had the opportunity to enter to win a $200.00 gift card raffle. We received a lot of interest in the raffle, and just as much interest in our company and student and recent graduate development programs. And the winner is: Daniela Aceto! Daniela, a student at Florida International University is earning her bachelor’s degree in the fields of business administration and marketing. Congratulations on winning the $200.00 gift card! If you want to learn more about All Florida Paper, and opportunities we have for students and recent graduates, please visit our careers website at www.allfloridapaper.com/careers.